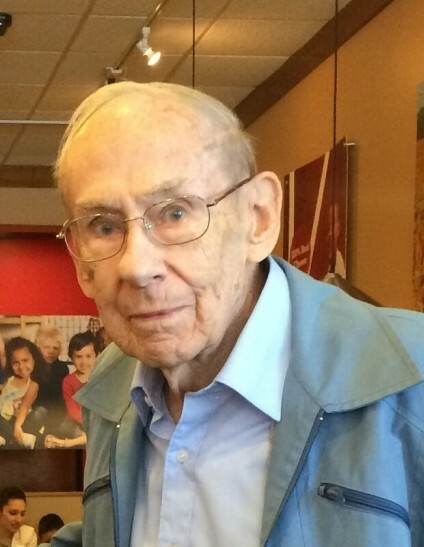 Obituary for Burt Bronson Sherwood | Medford-Peden Funeral Home & Crematory, Inc.
Burt Bronson Sherwood was born in Chester, Massachusetts on May 13, 1921. He passed away August 15, 2018 in Marietta surrounded by his family. He graduated from West Springfield High School, and at age eighteen he joined the Air Force. During World War II, he was stationed in the Pacific where he served as a Communications Chief with the 13th Reconnaissance Squadron. He held qualifications for marksmanship in both pistol and sharpshooting. When the war ended, he settled in Atlanta, later moving to Marietta where he remained until his death. He had a thirty-year career as an instructor with Lockheed Martin, eventually joining the Lockheed Flying Club. He was part of a team that was instrumental in the design of the C130 Hercules aircraft. In his retirement he loved pursuing interesting hobbies, one of which was building and flying model airplanes. He loved visiting and spending time with his family and always looked forward to family events. He is survived by his wife of fifty-four years, Peggy Kathleen Sherwood, and their son Gregory David Sherwood and his wife Lisa Ann Sherwood. He is survived by his two daughters from his first marriage, Elizabeth Anne Sherwood Weaver and Jill Sherwood Gardner. He is survived by seven grandchildren, Robert Vance Weaver, David Arnold Weaver, Anthony Bell Weaver, Elizabeth Anne Weaver II, Andrew Parks Gardner, Lindsey Elizabeth Jolluck, and Allen Mark Gardner, six great-grandchildren, and nieces and nephews. The family remembers his strength of character, his honesty and fairness with all people. His uncompromising values and unwavering integrity were such an influence on those that loved him. His quick wit and very dry sense of humor delighted us all, especially his nine year old great-granddaughter. Memorial service will be held at Covenant Presbyterian Church at 2881 Canton Road in Marietta, Georgia, Saturday, August 25, 2018, at 12:00 P.M. Interment will be Monday, August 20, 2018 at 11:15 at Georgia National Cemetery in Canton, Georgia. In lieu of flowers, please send donations to the Wounded Warrior Project: https://www.woundedwarriorproject.org.